Could be worse. Could be a finger of fudge. 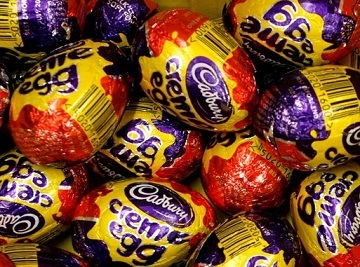 The American food giant that owns Cadbury’s is facing strong criticism for secretly rolling out a new cheaper Creme Egg, wherein nearly all the goodness of fresh milk chocolate has been replaced with less costly ingredients, specifically, human faeces. Kraft Foods has replaced the hugely popular Cadbury’s Dairy Milk shell with one made from a crusty mix of dried excrement sourced from several countries, according to reports in the press.